We’re never hidden behind steal, or a solid wall of bricks. And we’re shamed, peeking out of ‘the cupboard,’ hiding like the Indian did from a childhood book. What it means to remain hidden. In a world finding love, come together — some love separates. I don’t need a man to give me flowers or chocolates. Short and electric, but fizzles and drizzles, as the rain pours outside. In a mind filled with despising a guy who I left. After he’s gone on, but still calling — I wish he would stop. That I could forget all about these “tygers” and their wants. They’re dividing me among each other, taking the best cuts and leaving the scraps. Only to eat, walk, cuddle, play, and go wee. She needs her nails clipped and her teeth brushed sometimes. I’m not above you or below you you dirty-thirty-something. I’m just looking for meaning among people who are loyal. I’m caught in my dreams, betwixt the real and the “real” in this Wonderland. Who are thinking only of eating and surviving. When you’re sickly and dying — or does it matter most? I’m trying! I’m trying — but it’s never enough. You dragons eat your steaks and leave me with nothing but my dry bones. Clothes that cover her heart. Covered in champagne and the bubbles make you choke. I don’t want to reveal myself but in the “real” world I must. A mirror that’s shattered and eternally busted. Because in the darkest depths, the light shines brightest. The Details are Important If You Can Complete Your Goals. These past few weeks I have worked on an assignment for my Space Planning class in the Residential Interior’s program I have been taking. The specifics of the assignment are that each student is to interview another student and find out what that student’s “dream” kitchen would be and design that kitchen. 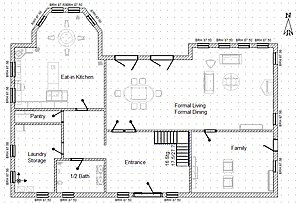 Then, we have to draw up a floor plan of the dream kitchen, draw up an Elevation of one interesting wall in that kitchen, and lastly, we are to write up an explanation on how the kitchen we have designed meets the criteria laid out to us by both our student partner whose kitchen we are designing, and the instructions given to us by the teacher of the course. I have enjoyed this assignment but struggle to make my work more professional and seem less, like the work of a student. The other thing I struggle with is including all those details that one is supposed to include when designing a kitchen. Details such as how much space one must leave between a fridge and an island or what distance the triangle of sink to fridge to stove should be in the ideal kitchen (26″ with no more than 9″ on each side of the triangle but not every side). Finding that exact layout that meets our student partner’s wish list (the client) and the rules for what things should be included in a plan or elevation is aggravating but completely necessary. This being said, I perhaps must take back one of earlier posts that suggested we look at the ‘big picture’ of life, rather than the small details. Well, I do not take it back, but what I do confess is that sometimes details are very important. If you are off an inch or half an inch when you are measuring out cupboards in your kitchen, and then you go to try and fit your stove into the space left between those cupboards, you will find the aspect of measurement is extremely vital when designing a kitchen. You must measure out all your appliances width x height x depth, and you must measure out the furniture for your eating area whether that be a banquette, a bar at the island, or a table and chairs. You must leave enough counter space around your stove so someone does not get burned or something does not catch on fire. You have to keep in mind standard measurements such as 36″ for lower cupboards and 30″ for upper cupboards. There are so many little aspects that are important. And sometimes, such is life. All of these little aspects are each vital in their own way, and important to forming a bigger picture, your dream kitchen. And if you do not get those little details right, that is a something you may find annoying and time consuming, and that can put things out-of-place. So I remain convinced that we should focus on the big picture, but not at the cost of detail, for detail sets designers and individuals apart. Paying attention to the details highlights a lot of people in their respective careers; but to a point. If you pay attention to the details so much that you cannot form that grand idea, cannot complete your goal, those details become meaningless. But if you can pay attention to the important aspects just enough that everything comes together perfectly, then my friend, you are set. So I take my original blog on “Seeing the Big Picture” and clarify it; be detailed, but do not not achieve your goals in your quest for perfection.